A few weeks ago I spent a short day exploring Comb Ridge and revisiting a few sites I had been to before. One of the sites I revisited was The Procession Panel. This large petroglyph panel is situated near the crest of Comb Ridge and there are spectacular views over Cedar Mesa and Lime Ridge nearby. 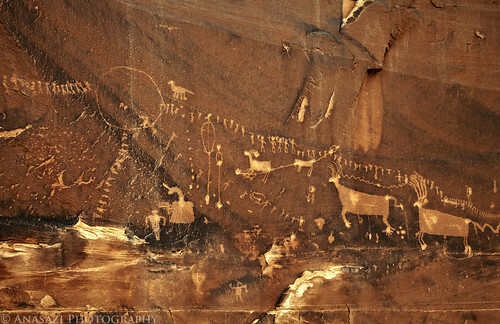 This petroglyph panel is named after the lines of small figures that appear to be in a ‘procession’ towards the large circle shown in this photo.